Native American Facts For Kids was written for young people learning about the Beothuks (Red Indians) for school or home-schooling reports. We encourage students and teachers to visit our main Beothuk site for in-depth information about the tribe, but here are our answers to the questions we are most often asked by children, with Beothuk pictures and links we believe are suitable for all ages. Photos are the property of the sources we have credited. What is the correct pronunciation of "Beothuk?" What does it mean? How Beothuk people pronounced this name was never accurately recorded. Most English speakers have pronounced Beothuk BEE-oth-uck, although some have pronounced it BAY-oth-uck or BEE-oth-ick. No one knows its meaning, though some scholars have suggested "the people," "good people," or "kinship." Why were Beothuks called "Red Indians?" Was their skin red? Their skin wasn't really red, but the Beothuks painted their bodies and clothing with red ochre paint. Many Indians used red ochre as an insect repellant, but the Beothuks considered red a sacred color and wore it all year long. Neighboring tribes called them the Red People, and the Europeans called them Red Indians. Aren't other tribes Red Indians too? Some Europeans started using "Red Indians" to refer to all Native Americans, not just the Beothuk tribe. Other tribes strongly dislike this term, though. They consider "Red Indian" a racial insult, and prefer to be called American Indians, Native Americans, or First Nations. The Beothuks were the original natives of Newfoundland, Canada. Yes. 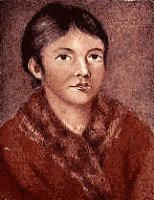 The last member of the Beothuk tribe, a woman named Shanawdithit, died in 1829. She did not have any children. Why did the Beothuk Indians die out? There were many factors, all related to colonization. First, some Beothucks were killed by Europeans or died of European diseases like smallpox. Second, population pressures hurt the Beothuks. As Europeans forced more Indian tribes westward and northward, there was no longer enough food for all of them. The Beothucks were pushed into the barren interior of Newfoundland, and many of them starved to death. Third, the Beothucks were very isolated. They didn't have Indian or Inuit allies to help them, and they never learned to communicate with the Europeans. The combination of violence, disease, starvation, and isolation was deadly. The Beothuck tribe is one of the only Native American nations with no known survivors. Is it possible there are still Beothuk Indians alive today? There are probably Indians in other tribes who have a Beothuk ancestor in their family tree. Some Beothuks were said to have escaped and joined the nearby Innu or Micmac tribes. Other Beothuks may have been captured by raiding Micmac or Mohawk warriors, who often adopted prisoners-of-war as family members. But any Beothuk refugees or adoptees were quickly absorbed into the larger nations that gave them shelter. Unlike other eastern Canadian tribes, no one still practices the unique culture the Beothuks once had. What language did the Beothuks speak? The Beothuk tribe had their own language which was distinct from all other Indians. Some linguists think it was related to Montagnais Innu and Cree, but others think it was unique. Here is a list of a few words from the Beothuk language. What was Beothuk Indian culture like? Here's a good overview of Beothuk culture. If you need more information, here's an online book about the lifestyle of the Beothuk tribe. What were Beothuk homes like? Beothuk house The Beothuks didn't live in tepees. They built wigwams, which were called mamateeks in their own language. Mamateeks were cone-shaped wooden houses covered in birchbark. Here is a larger picture of a Beothuk mamateek, and a page on Native American housing in general. There were also large rectangular buildings in Beothuk Indian villages for drying and storing meat. What did Beothuk clothing look like? Did they wear feather head dresses and face paint? Shawnadithit's drawing Beothuk women and girls wore skirts with wraparound mantles. 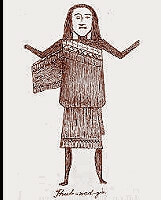 Shawnadithit's drawings include this picture of a woman in Beothuk clothing. Beothuk men and boys wore breechclout and leggings. For warmth, Beothuks wore long, poncho-like cloaks. Like the Inuit, women carried their babies in their hoods. Beothuk costume also included mittens and moccasins. Here are some photographs and links about Native American dress in general, with information about traditional clothing styles similar to those the Beothuks wore. The Beothuks didn't wear feathered headdresses like the Sioux. Sometimes they wore peaked caps like the Micmacs, though the Beothuks didn't decorate theirs with beadwork. Uniquely, the Beothuk Indians always painted their faces, bodies, hair, and costumes a bright red color. What did Beothuk Indians use for transportation? Did they paddle canoes? Beothuk canoe Yes, the Beothuks had distinctive humpbacked canoes that arched up in the middle, like the one in this picture. They traveled along the coast in these boats and used them to spear fish. In the winter, Here is an article with pictures of Native American canoes. Beothuk people used snowshoes to travel overland. There were no horses in North America until colonists brought them over from Europe, and it's doubtful the Beothuks ever saw one. Beothuk spearhead What did the Beothuks eat for food? The Beothuks fished with spears, gathered eggs and plants along the coast, and hunted caribou and seals. Sometimes they built fences from fallen trees to drive caribou in a good direction for hunting. Here is a website about Beothuk hunting and another with more information about Native Indian food. What kinds of weapons and other tools did the Beothuks use? Beothuk weapons included spears and harpoons, bows and arrows, and stone knives. Originally they made tools out of stone, wood, and bone. After Europeans arrived the Beothuks began using iron for tools and weapons. Here is an article with more images of Beothuk artifacts. Here is a website with information about Indian weapon types. Who were some famous Beothuk Indians? Portrait of Demasduit A young woman named Shawnadithit (also spelled Shanawdithit) was probably the last Beothuk. Starving and alone, Shawnadithit and two female relatives surrendered to the British. The other Beothuk women died, but Shawnadithit lived for six years as an English slave called "Nancy," drawing pictures and telling stories of her lost tribe. Shawnadithit's aunt Demasduit, who died several years earlier, had a more tragic story. Demasduit had just given birth when the British raided her village, and her husband, the Red Indian chief, was killed trying to protect her from capture. Her baby was left behind, and by the time she learned enough English to explain this to the British, the infant had starved to death and Demasduit was fatally ill with tuberculosis. In the face of these hardships, the charm and gentle demeanor of Demasduit and Shawnadithit startled white Newfoundlanders, forcing them to rethink some of their attitudes towards 'savages.' Read more about Shawnadithit and Demasduit. Were the Beothuks really the Skraelings of Viking sagas? Are the Viking sagas a trustworthy source? They're probably as trustworthy as British government records about the Beothuks from the 1700's. I'd take the Vinland Sagas with a grain of salt--the pregnant Norsewoman ripping off her bodice and singlehandedly routing the Skraeling warriors seems like it may be fictional, for example. But ruins of the Newfoundland Viking settlement were found at L'Anse aux Meadows, so at least part of the legend was true. Unfortunately, the Beothuks died without leaving any literature or history of their own behind. You could read the Vinland Sagas, which is the Viking description of their interactions with the Skraelings. Or you could read All Gone Widdun or A Deadly Distance, two moving historical novels about Shawnadithit and the Red Indian tribe. Both books are very interesting. There is also an anthropology book about the Beothuk people, called A History and Ethnography of the Beothuk, although it can be hard to read for younger kids. You can also browse through our reading list of good Native American books in general. You will need to ask your teacher for the format he or she wants you to use. The authors' names are Laura Redish and Orrin Lewis and the title of our site is Native Languages of the Americas. We are a nonprofit educational organization working to preserve and protect Native American languages and culture. You can learn more about the definition of our organization here. Our website was first created in 1998 and last updated in 2015. Thank you for your interest in the Beothuk Indian people and their language! An overview of the Beothuk people, their language and history. Beothuk language samples, art icles, and indexed links. Related links about the Red Indians.